Home » How to Succeed in Business Without Really Trying » Daniel Radcliffe in talks for possible film adaption of "How to Succeed"
Daniel Radcliffe in talks for possible film adaption of "How to Succeed"
Daniel Radcliffe told the Daily Mail earlier this week that he and the producers of How to Succeed in Business Without Really Trying are currently in discussions to bring the musical to the big screen. He mentioned in passing that there has been talk between him and producers Craig Zadan and Neil Meron about doing a big-screen version of How To Succeed. But if that were to happen the book (by Abe Burrows, Jack Weinstock and Willie Gilbert) would have to be overhauled. It works fine on stage, but for the screen someone would have to give it more zing. 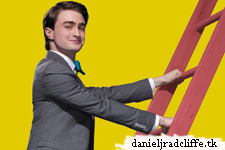 ‘Sometimes I was dancing for nine hours a day when I wasn’t filming,’ Daniel told me. ‘I didn’t want the last Harry Potter film to come out and people to say: “So, what does he do now? How does he follow that?” I’m already doing it! I’ve made another film and I’m on Broadway for the second time,’ he told me, in a reference to his five-month run in Equus — a repeat of the part he’d played in the West End. ‘I’m doing this for nine months, and I did Equus for five months here and that felt like a long time. I was exhausted after that, so I have to learn to keep my energy levels up with diet and exercise. ‘The rest of the cast work tremendously hard, but I have just two big numbers — Grand Old Ivy and Brotherhood Of Man — and there’s a lot of dancing and singing. They’re exhilarating to do and I love that this is so different from everything else I’ve done. I’m not repeating myself,’ Daniel added.